Lord of the Rings Online, the MMOG set in J.R.R. Tolkien's legendary fantasy world, will become a free-to-play game later this year. Raise your hand if this sounds familiar: A Turbine MMOG based on a popular fantasy property makes a grab for some World of Warcraft pie but ends up with nothing but a fork in its hand for its trouble. After sulking (and bleeding) for awhile, it heads for a nearby soup kitchen for some free grub and discovers to its amazement that the food there is actually pretty damn good and there's lots of it, too. I could be referring to Dungeons & Dragons Online, which went free-to-play in September 2009, but I'm actually talking about its fellow fantasy MMOG Lord of the Rings Online. WBIE and Turbine have announced that LOTRO will transition to a free-to-play model in North America and Europe this fall, with options for "a la carte" account upgrades and a VIP subscription package for fans who don't want to mess around. "The popularity of DDO validated the extraordinary demand by gamers for quality entertainment they can experience at their own pace and within their budget," said Turbine President and CEO Jim Crowley. 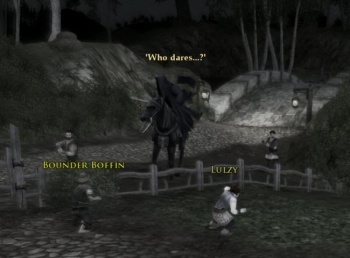 "Extending free-to-play to LOTRO will offer another premium game to a broad spectrum of fans." But Dungeons & Dragons Online was floundering and slowly sinking, and its transition to free-to-play was more or less a desperation move, whereas LOTRO, by all reports, has done reasonably well since its debut in 2007. So why the change? As the DDO experience proved, "free" can actually be quite lucrative. In February, Turbine announced that DDO revenues had actually increased by 500 percent since subscription fees were made optional. A beta test for the "new" Lord of the Rings Online will begin on June 16. To sign up or learn more about the game's future, check out lotro.com.